I study different aspects of the debris disk phenomenon and transport and radial mixing in circumstellar disks, both in the Solar system and in extrasolar planetary systems, using radiative transfer and dynamical models and observations. My interests include the statistical properties of the disks as derived from debris disk surveys (e.g. frequency, dust temperature/location, temporal evolution, debris disk-planet correlation, as derived from surveys carried out with Spitzer, Herschel, JCMT, etc. ), the study of individual systems, the search for planets in protoplanetary and debris disks via direct detection, the exchange of debris between our solar system and other planetary system, and interstellar interlopers.All these studies shed light on the planetesimal and planet formation processes and help us place our Solar system into context. 1I / 'Oumuamua was been the first interstellar object (beyond dust particles) that has ever been detected crossing our solar system. Its interstellar origin is unequivocal because its orbit is clearly hyperbolic, very different from the orbits of the solar system comets. Despite the fact that for decades the detection of an object of these characteristics had been anticipated, its discovery has been a surprise and has left many open questions. Among the questions left unanswered are those related to its physical properties, such as its size, shape and albedo. 1I / 'Oumuamua is a very small object, of the order of about 100-200 m in diameter, much smaller than the comets that we usually observe in our solar system that are several kilometers in size. The only reason why 1I / 'Oumuamua could be detected, despite its small size, was because it happened to pass very closed to the Earth on its way out of the solar system. That's partly why his detection caught us by surprise. 1I/'Oumuamua presents drastic flux variations that have been attributed to a very elongated or oblate shape that is rotating (like the images shown on the right), so the object would appear very bright when it is oriented in a way that you see more or its projected area, and very faint when it is oriented in a way that you see less of it. But this is under the assumption that its albedo (or reflectivity) is uniform. If there were variations in the albedo (or reflectivity) across the surface, they could also contribute to the observed flux variation and in this case the object wouldn’t need to be that elongated or oblate. These albedo variations could be caused, for example, by fresh ice being deposited on some areas of the surface making them brighter, or by irregularities in the surface relief causing self-shadowing. Unfortunately, 1I/'Oumuamua was not detected in thermal emission, which could have set stronger constrains on its size, shape and albedo. Another open question is that, if you assume that 1I/'Oumuamua is representative of a background population of objects that is uniformly distributed in space, it is very difficult to account for all the free-floating 1I/'Oumuamua-like objects that this would imply are out there. In two previous papers, I have studied two of the most obvious potential sources of those free-floating objects: the ejection of planetesimals from protoplanetary disks and the unbinding of objects from the Oort clouds of other stars (due to the stars losing mass as they get old, or due to encounters with other stars). I found that protoplanetary disks and exo-Oort Clouds could only contribute to less than 1% of the objects that are supposed to be out there. 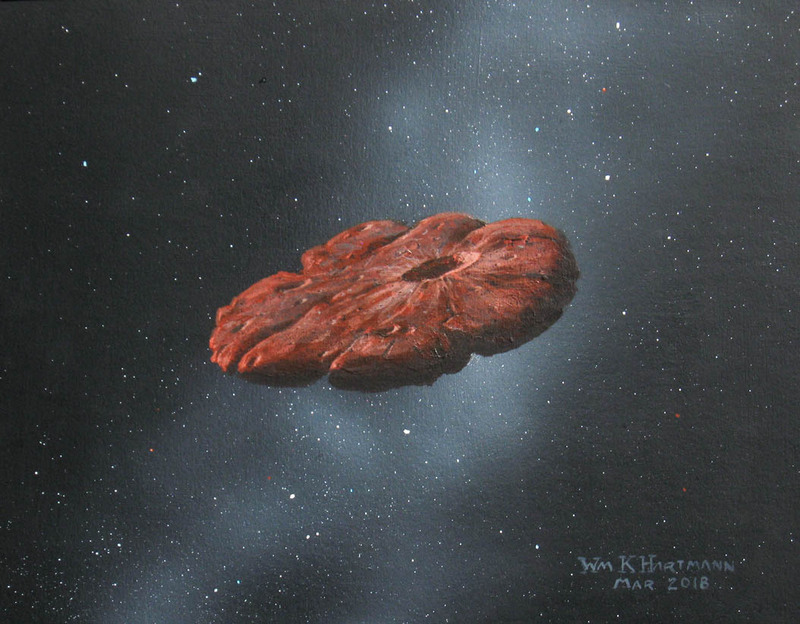 My conclusion is that 1I/'Oumuamua is likely not representative of a background population of free-floating objects but that it originated from a nearby star. The objects it ejected would not be uniformly distributed in space implying that there is not more material out there that we can account for. Furthermore, we think this nearby system was probably young because 1I/'Oumuamua, when it entered the solar system, was found to be moving at a velocity that is similar to the mean motion of the material in the neighborhood of the Sun, and this is the typical mean motion displayed by young stars (as time goes by and the stars age, their mean motion increases due to the effect of passing stars, giant molecular clouds or spiral arms). The other open question regarding 1I/'Oumuamua is the non-gravitational acceleration that was found in its outbound trajectory (Micheli et al. 2018). Something is “pushing” the object causing an excess acceleration. This effect has been observed in comets and the “propellant” in those cases is the outgassing that is produced when the cometary ices evaporate. It has been suggested that this is what is “pushing” 1I/'Oumuamua as well, but the problem is that the observations did not see any cometary activity in 1I/'Oumuamua. For example, the Spitzer observations published by Trilling et al. (2018) set upper limits to outgassing are at least 100 times smaller than what would be required to explain 1I/'Oumuamua’s excess acceleration. But these observations are only sensitive to a small number of gas species. If the composition of 1I/'Oumuamua were to be significantly different from that generally observed in comets, it could be that there is enough outgassing to “propel” the object from gas species that we could not have detected. Some comets do show significant variations in volatile components so it is a plausible explanation. Because of the lack of evidence of outgassing, Bialy and Loeb (2018) proposed that the “push” could be due to the pressure exerted by the radiation coming from then Sun, i.e. from radiation pressure. But they argued that for this to work, 1I/'Oumuamua would have to have an extraordinarily unusual geometry: a sheet that is only 0.3 to 0.9 mm thick. They suggested that 1I/'Oumuamua might represents a new class of thin interstellar material that is either produced naturally by an unknown process or artificially, like a lightsail. What I am proposing in this new paper is that radiation pressure could also produce the observed excess acceleration if the object, rather than having a planar sheet geometry, were to have the structure of a mass fractal (like the image shown on the left). I suggest a mass fractal structure because mass fractals provide a high area-to-mass ratio (required to be pushed by radiation pressure) and are found in many forms of nature. They are thought to arise naturally because their formation processes involve an element of stochasticity, like particle collisions in a solution, in a molecular cloud, or in a protoplanetary disk. 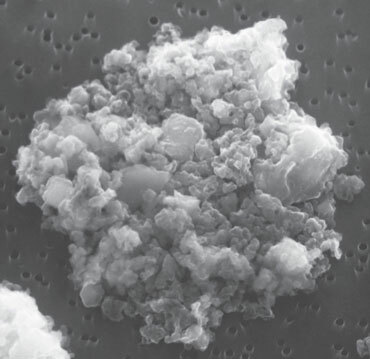 The unaltered cores of interplanetary dust particles (that can be collected and analyzed in the lab) are indeed mass fractals (an examplo of an interplanetary dust particle is shown in the image on the rigth). It my paper I find that for radiation pressure to account for the observed “push” in 1I/'Oumuamua, its fractal properties would be such that its density would be extraordinarily low density (of the order of 10-5 g cm-3 - lower than graphene aerogel, the lowest density, synthetically-produced material known – lighter than air). In the paper I point out that, at the microscopic level, there is observational evidence of the existence of very porous aggregates with extremely low densities < 10-3 g cm-3, detected by the GIADA instrument on ROSETTA and possibly also by Stardust. 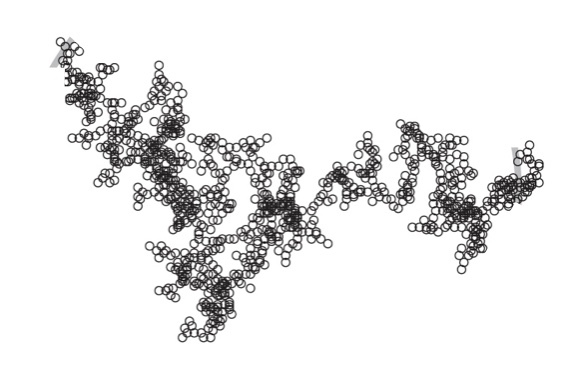 At the macroscopic level, evidence of the existence of such ultra-low density aggregates comes from numerical simulations. Let me give you some background before I tell you about these simulations. Stars are born in molecular clouds of gas and dust (in the image on the right this stage is represented by the two top figures). In some regions of the cloud the density is higher and this makes the region contract under the effect of its own gravity, eventually forming a ball of gas that is much denser and hotter than the rest of the cloud (in the image on the right this stage is represented by the middle-right figure). We call this a protostar. Around this protostar there is an envelope of gas and dust that is rotating and contracting at the same time. Because of conservation of angular momentum, this envelope transforms into a disk (bottom figure in the image on the right). The dust in this disk is primordial, i,e, the same dust that was originally in the molecular cloud out of which the protostar was born. These dust particles are very small, about 0.1 microns in size, and in the disk they collide with each other frequently. In some of these collisions, the dust particles stick to each other and form aggregates, that grow larger and larger as the aggregates themselves experience subsequent collisions forming what we call planetesimals. This is the very early stage of a process that, under some circumstances, can lead to the formation of planets, first the solid cores and then the giant planets, as the most massive cores attract the gas in the disk forming gaseous envelopes (this stage is represented by the image on top). There are numerical simulations that study this collisional growth of dust particles and they predict that, if the primordial dust particles are icy and about 0.1 microns in size, the aggregates that form beyond the snowline of the disk (i.e. beyond the region of the disk where volatiles like water, carbon dioxide, and carbon monoxide can be in ice form) will have a fractal structure that could have properties similar to the ones that would be required for 1I/'Oumuamua to be “pushed” by radiation pressure. So the idea is that 1I/'Oumuamua could be one of those intermediate early product of the planet formation process, that arise naturally from the collisional growth of icy dust grains. Since, under this scenario, the particles are required to have an icy component it could also be that the excess acceleration (the “push”) is due to a combination of radiation pressure and some level of outgassing. From the observational point of view, very little is known about these intermediate early products of planet formation around other stars because the observations only trace the two extremes of the size distribution: the dust particles in the small end and the planets in the large end. We only have information about these intermediate stages from our solar system and these are the comets that are thought to have experienced little alterations since they were formed. Comets are also aggregates but with much higher densities of about 0.1 g cm-3, i.e. not porous enough that the radiation pressure would cause the excess acceleration observed in 1I/'Oumuamua. So what is being proposed in this new paper is that 1I/'Oumuamua, rather than looking like the more compact planetesimals in our solar system (the comets or the more altered asteroids), resembles more one of those intermediate products of the collisional growth of icy dust particles predicted by the numerical simulations that are unlike anything we can observed in our (old) solar system. If 1I’Omuamua were to have such an origin, it would be extraordinarily interesting because its discovery would have opened a new window to study the building blocks of planets and this could set unprecedented constraints on planet formation models. I mentioned above that the collisional growth of dust particles can, under some circumstances, lead to the formation of planets, but there are many open questions because there are several barriers to the growth of dust particles that can impede planet formation. We know that in some cases these growth barriers are overcome because planets do form (we detect them!) but how this happens is still under investigation. The numerical simulations that I mentioned earlier suggest a possible solution to the growth barriers and is that the building blocks of planets are fluffy icy aggregates, with properties that might be similar to those that would allow 1I’Omuamua to be “pushed” by radiation pressure. This is why any type of observation that could shed light on the nature those building blocks would be very helpful in order to set constrains on planet formation models. And it would be just wild if it were the case that one of those building blocks were to cross the solar system as an interloper (like 1I’Omuamua did). It would be almost as having a free return mission to an extrasolar planetary system. Many things need to be studied to assess the viability of this hypothesis. One of the main aspects that need to be studied is the survival of such a porous aggregate under different stresses, including tidal disruption (while in its parent system and while crossing the solar system), rotational disruption, and collisions with interstellar grains. The studies that have looked into these aspects have generally focus on significantly more compact objects and would need to be extended to study the survival of ultra-low density aggregates. Another aspect that would need to be investigated is to what degree the aggregate will get compressed due to ram pressure by the gas encountered in its parent system, during its long interstellar journey, and when entering the solar system. And then, one would also need to investigate if the optical properties of such an aggregate would be consistent with the observations of 1I/'Oumuamua. Another potential origin of such an ultra-porous object has been proposed by Z. Sekanina (arXiv:1901.08704). 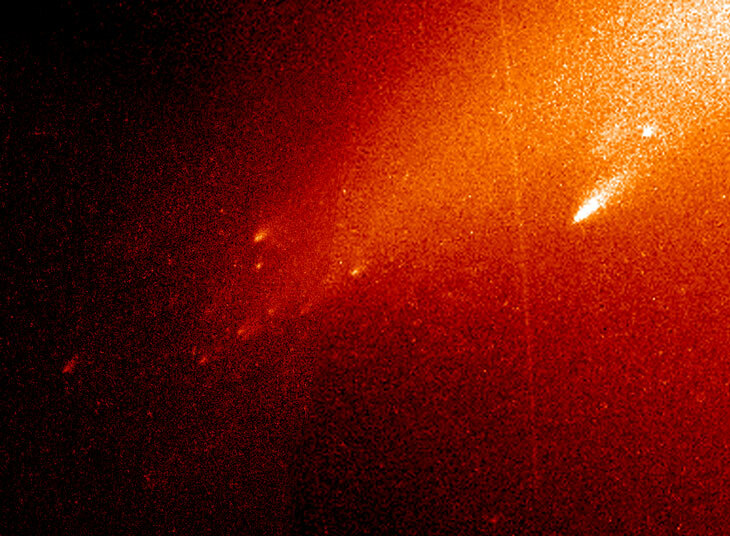 He points out that comets that pass close to the sun (at a distance smaller than the orbit of the Earth around the sun, q < 1 AU) commonly suffer sudden disintegration shortly before their closest approach to the sun and that the debris resulting from this disintegration process could include large, devolatilized, ultra-porous aggregates that may have an exotic shape and peculiar rotational properties (the image on the right shows the partial disintegration of comet LINEAR). He therefore proposes that 1I‘Oumuamua is a fragment left behind by the disintegration of a larger interestellar comet. This origin could explain 1I‘Oumuamua’s extra acceleration (because it would be subjected to radiation pressure from the sun), its irregular shape, rotation state, and for the fact that no outgassing has been detected. 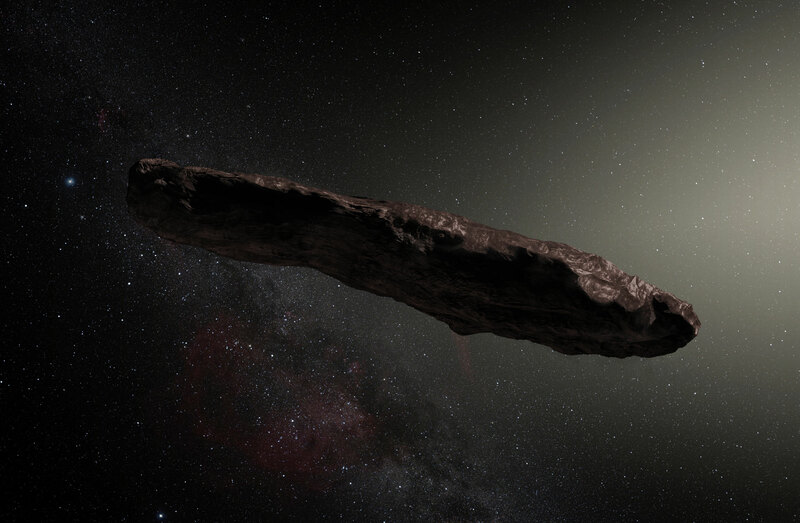 We would never be certain regarding 1I/'Oumuamua’s nature and origin because this object is now beyond our observing capability and the observations we have of it are limited. We will likely have to await for future encounters with other interstellar interlopers to assess whether 1I/'Oumuamua’s unusual properties are common among this population. It would be at that point that we will be able to place more constrains on the origin of these bodies. 1I/'Oumuamua ha sido el primer objeto interestelar (más allá de partículas de polvo) que se ha detectado cruzando nuestro sistema solar. Su origen interestelar es inequívoco porque su órbita es claramente hiperbólica, muy diferente de las órbitas de los cometas de nuestro sistema solar. A pesar de que desde hacía décadas se había anticipado la detección de un objeto de estas características, su descubrimiento ha sido una sorpresa por la forma que ha sido descubierto (como parte de un censo que no es tan profundo) y porque su visita ha dejado muchos interrogantes abiertos. Entre las preguntas que su visita ha dejado sin contestar destacan las relacionadas con sus propiedades físicas, como su tamaño, forma y albedo. 1I/'Oumuamua es un objeto muy pequeño, del orden de unos 100-200 m de diámetro, mucho más pequeño que los cometas que solemos observar en nuestro sistema solar, con un tamaño de varios kilómetros. El único motivo por el cuál 1I/'Oumuamua pudo ser detectado, a pesar de su pequeño tamaño, fue porque dio la casualidad de que su trayectoria pasó muy cerca de la Tierra así que en ese sentido fuimos muy afortunados. Es por eso en parte que su detección nos pilló por sorpresa. 1I/'Oumuamua presenta drásticas variaciones de flujo que se han atribuido a una estructura muy alargada u oblata que está girando sobre si misma (como las mostradas en las imágenes de la derecha), por lo que el objeto parecería mucho más brillante cuando está orientado de manera que su área proyectada es mayor y mucho más débil cuando su área proyectada es menor. Pero esto es bajo el supuesto de que su albedo (o reflectividad) es uniforme. Si hubiera variaciones en el albedo (o reflectividad) de la superficie, éstas también podrían contribuir a la variación de flujo observada y, en este caso, el objeto no tendría que ser tan alargado u oblato. Estas variaciones de albedo podrían deberse, por ejemplo, a la deposición reciente de hielo en algunas áreas de la superficie (que las habría más brillantes) o a irregularidades en su relieve (que produciría sombras). Desafortunadamente, las observaciones con el telescopio espacial Spitzer no fueron capaces de detectar la emisión térmica de 1I/'Oumuamua, lo que hubiera ayudado a arrojar luz sobre sus propiedades físicas. Otros interrogantes abiertos son su origen y cuántos objetos similares a 1I/'Oumuamua existen en el medio interestelar, aspectos que están relacionados entre si. En Moro-Martín (2018) y Moro-Martín (2019a) llevé a cabo dos estudios para evaluar dos posibles orígenes de 1I/'Oumuamua: la expulsión de planetesimales de discos protoplanetarios (debido a interacciones gravitacionales con planetas) y la liberación de objetos de las nubes de Oort que se encuentran alrededor de otras estrellas (debido a la pérdida de masa estelar a medida que la estrella envejece o debido a interacciones gravitacionales con estrellas que pasan cerca). Si uno asume que 1I/'Oumuamua pertenece a una familia de objetos que están distribuidos uniformemente en el espacio, ambos estudios muestran que los discos protoplanetarios y las nubes de Oort contribuyen menos de un 1% de los objetos similares a 1I/'Oumuamua que se supone que están flotando en el medio interestelar. Mi conclusión es que 1I / 'Oumuamua probablemente no sea representativo de una familia de objetos distribuidos uniformemente, sino que su origen se sitúa en un sistema cercano cuyos objetos expulsados no han tenido tiempo de distribuirse de manera uniforme. Y es muy posible que este sistema cercano se trate de una estrella joven porque las observaciones indican que 1I/'Oumuamua, cuando entró en el sistema solar, se estaba moviendo a una velocidad similar a las de las estrellas jóvenes en el vecindario del Sol (a medida que las estrellas envejecen, su velocidad relativa aumenta debido a las perturbaciones causadas en su movimiento por encuentros con otras estrellas, con nubes moleculares gigantes o con los brazos espirales de la Galaxia). Otra incógnita con respecto a 1I/'Oumuamua es el origen de la aceleración no gravitatoria que se midió en su trayectoria de salida del sistema solar (Micheli et al. 2018). Hay algo que está "empujando" al objeto. Este efecto también se ha observado en cometas y el "propulsante" en esos casos es la desgasificación que se produce cuando los hielos cometarios se evaporan. Se ha sugerido que esto es lo que está "empujando" a 1I/'Oumuamua pero existe un problema con esta explicación y es que las observaciones de 1I/'Oumuamua no detectaron en ningún momento que tuviera actividad cometaria (es decir, no hay evidencia de desgasificación). De hecho, las observaciones de Spitzer (Trilling et al. 2018) establecen límites muy estrictos sobre cuánta desgasificación podría haber existido sin que hubiera sido detectada: más de 100 por debajo de lo que se requeriría para explicar el exceso de aceleración de 1I/'Oumuamua. Pero estas observaciones solo son sensibles a un pequeño número de especies de gas. Si la composición de mala de fuera significativamente diferente de la observada en los cometas del sistema solar, podría ser el caso que la desgasificación hubiera sido producida por otras especies de gas. En el sistema solar, existen algunos cometas singulares que muestran variaciones significativas en sus componentes volátiles con respecto al resto de los cometas, lo que hace que una composición anómala de volátiles en 1I/'Oumuamua pueda ser una explicación plausible. La falta de evidencia de procesos de desgasificación en 1I/'Oumuamua ha llevado a la búsqueda de otras explicaciones para su trayectoria anómala (para dar cuenta de ese “empuje” que está recibiendo). Bialy y Loeb (2018) propusieron que el "empuje" podría deberse a la presión ejercida por la radiación solar. Argumentaron que para que este escenario pudiera funcionar, 1I/'Oumuamua tendría que tener una geometría extraordinariamente inusual: una placa de solo 0.3--0.9 mm de grosor, sugirieron que 1I/'Oumuamua representaba una nueva clase de material interestelar delgado producido de forma natural por un proceso desconocido o de forma artificial (como una vela de luz), una propuesta controvertida que ha tenido mucho impacto en los medios de comunicación. En Moro-Martin (2019b) propongo una alternativa, que el “empuje” es causado por presión radiativa pero que el objeto, en vez de tener la geometría de una placa fina, tiene la estructura de un fractal de masa (como la imagen de la izquierda). Las razones por la que sugiero este tipo de estructura son: 1) porque puede proporcionar mucha área para una determinada masa, es decir, un cociente area:masa suficientemente alto para que el objeto sea empujado por presión radiativa; 2) porque son estructuras que se encuentran en muchas formas de la naturaleza y se forman de forma natural a raíz de procesos que involucran un elemento de estocástica, como por ejemplo las colisiones de partículas en una solución, en una nube molecular o en un disco protoplanetario. De hecho, los núcleos inalterados de partículas de polvo interplanetario (que pueden recogerse en el espacio o en la estratosfera y analizarse en el laboratorio) son fractales de masas (la image de la derecha muestra una de estas partículas). Para que la presión de radiación pueda explicar el "empuje" observado en 1I/'Oumuamua, sus propiedades fractales habrían de ser tales que su densidad sería extraordinariamente baja (del orden de 10E-5 g/cm3 - más baja que el aerogel de grafeno, el material producido sintéticamente de menor densidad -- más ligero que el aire). A nivel microscópico, hay evidencia observacional de la existencia de agregados muy porosos con densidades extremadamente bajas <10E-3 g/cm3, detectadas en el espacio por el instrumento GIADA en la misión ROSETTA y posiblemente también por la misión Stardust. Pero también existe evidencia numérica de la posible existencia de agregados de densidad ultra baja a escalas macroscópicas de tamaño comparable al de 1I/'Oumuamua (de unos 100—200 m de diámetro). Llegados a este punto, y para poder entender las implicaciones que esta hipótesis conllevaría, es pertinente hacer un brevísimo tour sobre formación estelar y planetaria. Las estrellas nacen en nubes moleculares de gas y polvo (como dos las nubes de la parte de arriba de la imagen de la derecha). En algunas regiones de la nube la densidad es mayor y esto hace que la región se contraiga bajo el efecto de su propia gravedad, formando una bola de gas que es mucho más densa y más caliente que el resto de la nube (en la imagen de la derecha este estado está representado por la nube que hay a la derecha a mitad de imagen). A esto le llamamos una protoestrella. Alrededor de esta protoestrella hay una envoltura de gas y polvo que gira y se contrae al mismo tiempo. Debido a la conservación del momento angular, esta envoltura se transforma en un disco que denominamos disco protoplanetario (en la imagen de la derecha esta etapa está respresentada por la figura de abajo). El polvo en este disco es primordial, es decir, es el mismo polvo que originalmente estaba en la nube molecular de donde nació la protoestrella. Estas partículas de polvo son muy pequeñas, de aproximadamente 0.1 micrones de tamaño, y en el disco chocan entre sí con frecuencia. En algunas de estas colisiones las partículas de polvo se adhieren entre sí y forman agregados que crecen cada vez más a medida que los agregados experimentan colisiones mutuas (en otras colisiones los agregados de rompen o rebotan). Estos agregados son lo que se conoce como planetesimales. Este proceso puede, bajo algunas circunstancias, llevar a la formación de planetas. En el caso de los planetas gigantes, primero se formarían los grandes núcleos y los más grandes serían capaces de atraer el gas del disco protoplanetario para formar las atmósferas de estos planetas (esta etapa del proceso está representada por la imagen de arriba). Volvamos ahora a 1I/'Oumuamua para explicar por qué todo esto es relevante. Existen simulaciones numéricas que estudian el crecimiento por colisión de agregados de polvo que predicen que, si las partículas de polvo primordiales tienen una componente de hielo y un tamaño de aproximadamente 0.1 micrones, los agregados que se forman más allá de la línea de nieve del disco (es decir, más allá de la región del disco donde volátiles como el agua, el dióxido de carbono y el monóxido de carbono pueden estar en forma de hielo) tendrán una estructura fractal que podría tener propiedades similares a las que se requerirían para que 1I/'Oumuamua fura "empujado" por la presión de radiación. Lo que argumento en Moro-Martin (2019b) es que 1I/'Oumuamua podría ser uno de esos productos intermedios del proceso de formación del planetas, que surgen naturalmente del crecimiento por colisión de agregados a partir de partículas de polvo cubiertas de hielo. Desde el punto de vista observacional, se sabe muy poco acerca de estos productos intermedios tempranos de la formación de planetas alrededor de otras estrellas porque las observaciones solo son capaces de detectar los dos extremos de la distribución de tamaño: las partículas más minúsculas (los granos de polvo) y las más grandes (los planetas). En cuanto a objetos de tamaño intermedio que resultan de este proceso, nuestra información se limita a lo que observamos en el sistema solar. Se cree que los cometas han experimentado muy pocas alteraciones desde que se formaron, pero el sistema solar no deja de ser un sistema muy evolucionado. Los cometas son agregados de partículas de hielo pero con densidades mucho más altas (0.1 g/cm3) que las de los agregados ultra porosos que estamos hablando, es decir, los cometas no son lo suficientemente porosos como para que la presión radiativa pueda causar un “empuje” similar al observado en 1I/'Oumuamua. 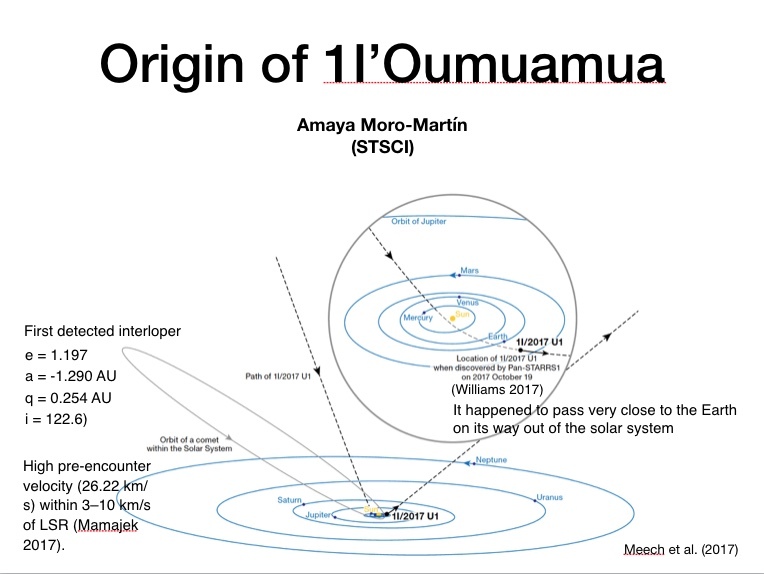 Lo que propongo en Moro-Martin (2019b) esque 1I/'Oumuamua, en lugar de parecerse a estos planetesimales más compactos de nuestro sistema solar (los cometas), pueda parece a uno de esos productos intermedios del proceso de formación de planetas que, según estudios numéricos, resulta del crecimiento por colisión de agregados de polvo a partir de partículas que tienen una componente de hielo. Si 1I/'Oumuamua tuviera ese origen sería extraordinariamente interesante porque su descubrimiento abriría una nueva ventana para estudiar los "bloques elementales" de los planetas y esto podría arrojar luz sobre los diferentes modelos de formación. Como mencioné anteriormente, el crecimiento por colisión de partículas de polvo puede, en algunas circunstancias, conducir a la formación de planetas, pero hay aspectos que no entendemos de este proceso, como por ejemplo cómo los agregados son capaces de vencer las barreras que existen para su crecimiento. Sabemos que, en algunos casos, estas barreras de crecimiento se superan ¡porque los planetas existen! Pero aún se está investigando cómo sucede esto. Las simulaciones numéricas que mencioné anteriormente sugieren una posible solución a estas barreras de crecimiento: que estos "bloques elementales" sean agregados de hielo ultra-porosos, lo que les dotaría de una gran sección eficaz que sería capaz de acelerar su proceso de crecimiento y superar las barreras. Estos "bloques elementales" nunca han podido ser observados y albergan una información muy valiosa sobre cómo se forman los planetas. Las simulaciones dinámicas indican que muchos de estos "bloques elementales" son expulsados de sus sistemas de origen y están distribuidos por el espacio, y eventualmente algunos han de cruzar el sistema solar. Sería por tanto extraordinario si fuera el caso que 1I/'Oumuamua fuera uno de esos “bloques elementales”. Sería casi como tener una misión de retorno a un sistema planetario extrasasolar en formación. Uno de los aspectos principales que deben estudiarse para evaluar la viabilidad de esta hipótesis es si un agregado tan ultra-poroso sobreviviría a la compactificación producida por el gas en el disco protoplanetario, a las tensiones producidas en el proceso de eyección de su sistema de origen, a las producidas por su propia rotación, por las colisiones con partículas interestelares, a la evaporación del hielo debido a las altas temperaturas alcanzadas en su paso cerca del Sol. Los estudios que han analizado algunos de estos aspectos se han centrado generalmente en objetos significativamente más compactos y deberían ampliarse para estudiar la supervivencia de agregados de densidad ultra baja. Otro aspecto que habría que investigar es si las propiedades ópticas de tal agregado serían consistentes con las observaciones de 1I/'Oumuamua. Z. Sekanina (arXiv: 1901.08704) ha propuesto otro posible origen de un objeto ultra-poroso. En su estudio apunta que los cometas que pasan cerca del Sol (a una distancia más pequeña que la órbita de la Tierra alrededor del Sol, es decir, con un perihelio de menos de 1 AU) comúnmente sufren una desintegración repentina poco antes de alcanzar su mínima distancia al Sol (la imagen de la derecha muestra la desingegración parcial del cometa LINEAR). Los escombros resultantes de este proceso de desintegración pueden incluir grandes fragmentos que se asemejan a un agregado ultra-poroso de granos de polvo desvolatilizados que pueden tener una forma exótica, propiedades de rotación peculiares y una porosidad extremadamente alta, propiedades similares a las que podría tener 1I/'Oumuamua. Z. Sekanina propone que 1I/'Oumuamua es un fragmento producido por la desintegración de un cometa interstellar más grande. Este origen podría explicar el "empuje" que está recibiendo 1I/'Oumuamua (porque al ser ultra-poroso estaría sujeto a la presión radiativa que hemos discutido anteriormente), pero también podría explicar su forma irregular, estado de rotación y el hecho de que no se ha detectado desgasificación. Nunca tendremos certeza sobre la naturaleza y el origen de 1I/'Oumuamua porque las observaciones que tenemos de este objeto son limitadas. Es probable que tengamos que esperar a futuros encuentros con otros intrusos interestelares para evaluar si las propiedades inusuales de 1I/'Oumuamua son comunes entre esta población y qué implicaciones tiene sobre el origen de estos objetos. A planetesimal is a solid object larger than approximately 1 km in size that arises during the formation of planets, as small dust particles from the disk of gas and dust that gave birth to the star accumulate into larger and larger bodies. Terrestrial planets and giant planets solid cores are the result of planetesimal accumulation. The age of the Sun is approximately 4,600 million years. 1 AU (astronomical unit) is the distance between the Earth and the Sun. The Solar system's planetesimal belts are located between 2 and 4 AU (asteroid belt) and 35 and 50 AU (Kuiper belt). Debris disks are found around A- to M-type stars, and also around the progenitors of white dwarfs. Mid- and far-infrared observations with the Spitzer (3.6–160 μm) and Herschel space telescopes (70–500 μm) indicate that at least 10–25% of stars of age 10 million years to 10,000 million years harbor planetesimal disks of sizes 10s to 100s of AU (i.e. comparable or a few times larger than the Solar system). We know this because these stars are brighter than expected at infrared wavelengths, indicating that they are surrounded by dust disks. Because these stars are mature, the observed dust cannot be primordial (i.e. belonging to the protoplanetary disk that gave birth to the star) but is likely generated steadily or stochastically by collisions or sublimation of planetesimals. Most likely the fraction of stars harboring these dust disks (a.k.a. debris didks) is even higher, but they are too faint to be detected by current instrumentation. We find evidence for planetesimals around stars with a wide range of masses and luminosities. 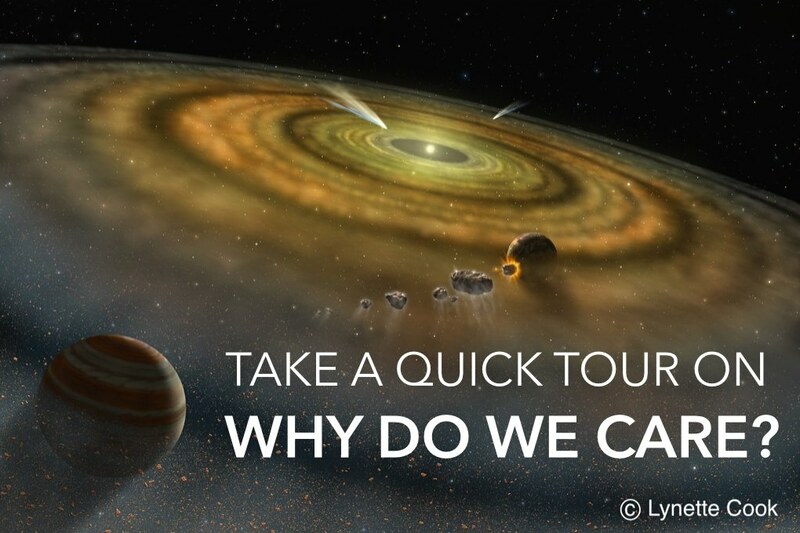 This implies that planetesimal formation, the first step of planet formation, is a robust process and can take place under a wide range of conditions. Our Herschel observations had a 3-σ detection limit at 10–20 times the level of dust in the current Kuiper Belt, estimated to have a fractional luminosity of Ldust/Lsun = 3×10-7. The figure below (from Moro-Martín et al. 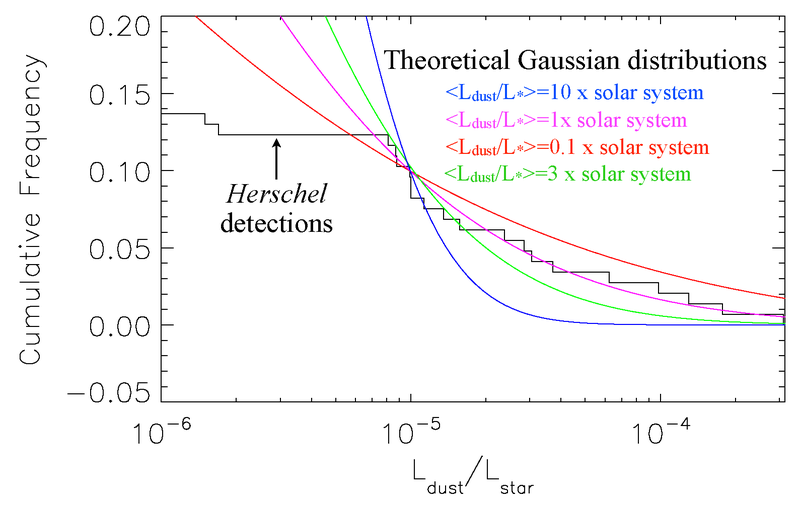 2015) shows the distribution of the fractional luminosity of the dust, Ldust/Lsun, of an unbiased sample of 204 solar-type stars observed by the Herschel space telescope. The theoretical Gaussian distribution centered on the solar-system value -magenta line- fits the data well, while one centered at ten times the solar-system debris disk -blue line- exceeds the most optimistic case, so it can be rejected. The sun also harbors a debris disk, produced by the asteroids, comets, and Kuiper Belt objects, with a production rate of dust that has changed significantly with time, having been higher in the past, when the solar system was less than 700 million years old. At those earlier times, the asteroid and Kuiper belts were more densely populated; they were depleted heavily when the giant planets migrated from their formation location to their current orbits. Today, the solar system’s debris disk is fainter than the faintest extrasolar debris disks we can observe with the Herschel space telescope. Even tough we cannot yet observe debris disks as faint as that of the solar system, extrapolating from current observations there is evidence that the solar system might be average in terms of its dust content. Herschel detects emission from cold dust at 10s of AU from the stars with excess emission at 100 μm. But this dust can been transported inward by Poynting-Robertson drag (resulting from the interaction of the dust particles with the stellar photons). One of the reasons why we are interested in this dust closer to the star is because it poses an observational issue for direct planet detection, due to the background noise and confusion it may introduce. The results above are good news because the implied low level of dust at a few AU would not measurably reduce the expected performance of a large ATLAST-type optical space telescope (around 12 m in diameter), designed to detect and characterize exoplanets. Note, however, that comets and asteroids located closer to the star are also sources of dust. For those sources, the long-wavelength observations by the Herschel space telescope do not provide constraints. Nevertheless, lower emission from Kuiper Belt-type dust likely implies less populated outer belts, which could reduce cometary activity. 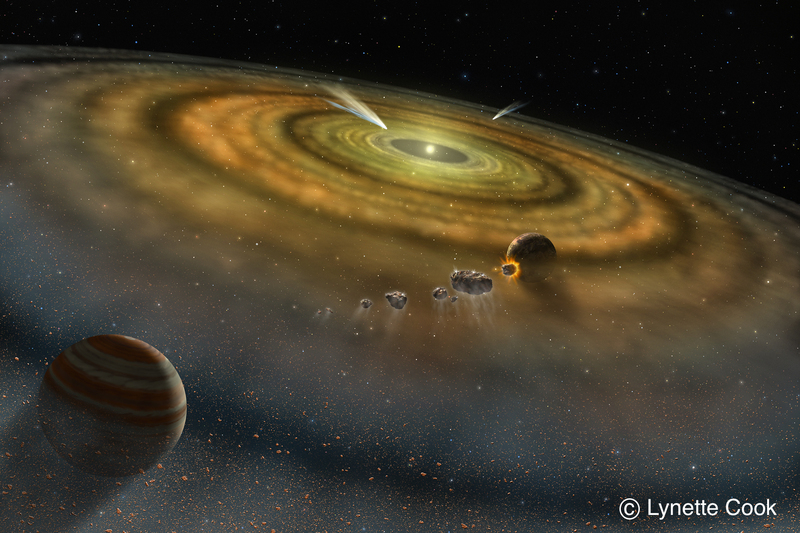 Another link between debris and the search for life is the exchange of solid material (debris) between young planetary systems, which may be more efficient than previously assumed. Having only one example of a habitable planet, there is little certainty regarding the frequency and timescale of abiogenesis once the conditions for life are met. Life could arise in situ, or it could be transferred from somewhere else. The exchange of meteoroids between the terrestrial planets in our solar system is a well-established phenomenon. The identification of a handful of meteorites on the moon and Mars has given rise to the concept of lithopanspermia: the transfer of life from one planet to another via the exchange of meteoroids. Nevertheless, the idea of lithopanspermia between different planetary systems—as opposed to between planets in the same system—has had a serious problem: extremely low transfer probabilities. Stars are generally born in clusters with hundreds to thousands of members that dissipate in tens to hundreds of million years. The efficiency of the exchange depends on the masses of the stars involved. For stellar masses between 0.5 MSun and 1 MSun, we find that about 0.05–0.15% of the meteoroids that leave the first planetary system on nearly parabolic orbits are trapped by the second planetary system. This capture efficiency is a billion times larger than was found by previous studies using hyperbolic orbits to transfer meteoroids between the Sun and its nearest neighbor—after the stars have left the birth cluster. Encouraged by the high frequency of planetesimals around solar-type stars, we revisited the issue of the transfer of debris between young nearby planetary systems still embedded in their birth stellar cluster. We found that the transfer probabilities are greatly increased when considering quasi-parabolic, chaotic orbits. The figure to the right (from Belbruno et al. 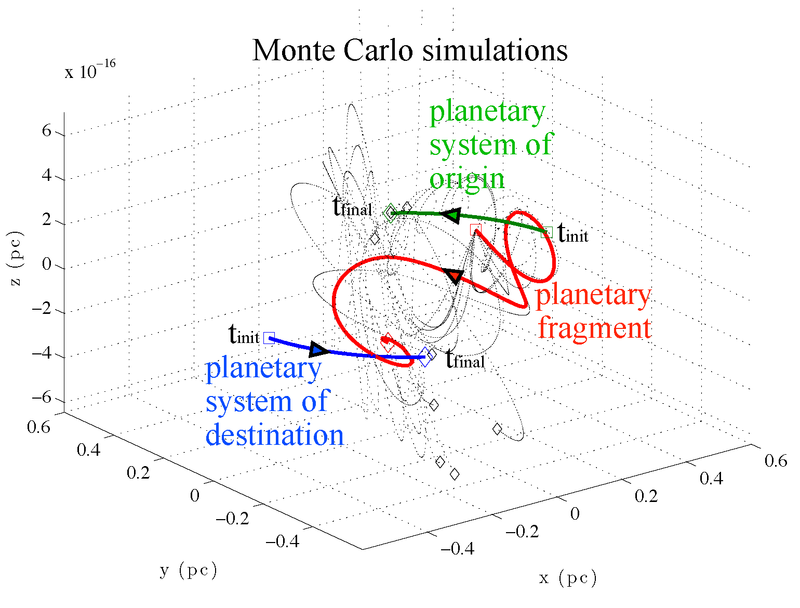 2012) shows a few examples of the million Monte Carlo realizations carried out, showing the chaotic trajectory of a meteoroid that is successfully transferred between two stellar neighbors (in red), and others that are not transferred (dotted black lines). For lithopanspermia to be a viable hypothesis, we not only need an efficient transfer mechanism (discussed above), but we also need life to have developed on Earth before the cluster dispersed (after which the transfer probabilities would become too low). Is there evidence that this could have been the case? From the isotopic ratio of oxygen found in zircons, there are indications that liquid water was present in the crust of the Earth when the solar system was as young as 164 or 288 million years old, depending on the study, which indicates that habitable conditions might have been present early on. Other studies show that the isotopic ratio of carbon in old sedimentary rocks indicates evidence of biological activity when the solar system was only 718 million years old. The timescales for abiogenesis (the natural process of life arising from non-living matter) are thought to range from 0.1–1 million years for hydrothermal conditions at the deep sea, to 0.3–3 million years for warm-puddle conditions in shallow water, to 1–10 million years for subaeric conditions in the soil—all at least an order of magnitude less than the lifetime of the stellar cluster. If life arose on Earth shortly after liquid water was available on its crust, the window of opportunity for life-bearing rocks to be transferred to another planetary system in the cluster opens when liquid water was available (when the Solar system was 164–288 million years old), and ends by the cluster dispersal time (when the Solar system was 135–535 million years old; see bottom and top timelines in the figure below). Not only there is this window of opportunity, but there is evidence that heavy bombardment ejected large quantities of possibly life-bearing rocks from Earth, ejecting them to outer space. This bombardment period lasted from the end of the planet–accretion phase until the end of the late heavy bombardment 3800 million years ago, when the solar system was approximately 770 million old. The bombardment is also evidence that planetesimals were being cleared from the solar system several hundred million years after planet formation. 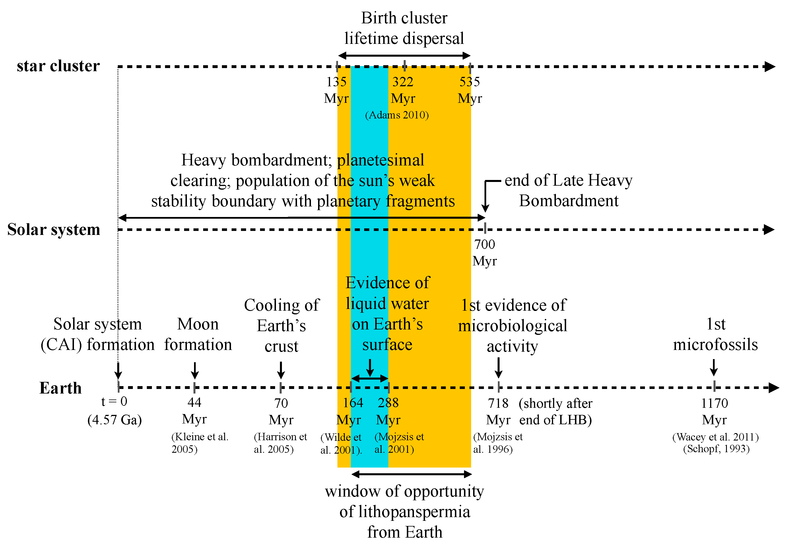 This period of massive bombardment and planetesimal ejection from the Solar system completely encompassed the “window of opportunity” for the transfer of life-bearing rocks, providing a viable ejection mechanism for lithopanspermia (see middle timeline in the figure above). But there is one final consideration to assess if lithopanspermia could be viable: Is the time for survival of microorganisms in deep space longer than the characteristic transfer timescale? In other words, could microorganisms surive long interstellar journey? Microorganisms can be sheltered from the hazards of outer space (ultraviolet light, x-rays and cosmic rays) if hidden below the surface of the rocks. Survival for millions of years cannot be tested with direct experiments (e.g., experiments testing the survival on the surface of the Moon lasted only a few years), but there are computer simulations that model the conditions in outer space for extended periods of time. Based on these studies and comparing to the timescales involved in the weak-transfer mechanisms, including the time it might take to land on a terrestrial planet, we found that microorganisms could survive the long interstellar journey hidden in meteoroids larger than about one meter. All the considerations above indicate that it is therefore possible that life on Earth could have been transferred to other planetary systems when the Sun was still embedded in its stellar birth cluster. But could life on Earth have originated beyond the boundaries of our solar system? Our results indicate that, from the point of view of dynamical transport efficiency, life-bearing extrasolar planetesimals could have been delivered to the solar system if life had a sufficiently early start in other planetary systems, before the solar maternal cluster dispersed. An early microbial biosphere, if it existed, would likely have survived the Late Heavy Bombardment. Thus, both possibilities remain open: that life was “seeded” on Earth by extrasolar planetesimals, or that terrestrial life was transported to other star systems via dynamical transport of meteorites. Regarding the search for life beyond our solar system, this opens a new world of possibilities to dream about, given how many extra-solar planetary systems are out there and how tremendously diverse they are. The study of the planet-debris disk connection can shed light on the formation and evolution of planetary systems and may help “predict” the presence of planets around stars with certain disk characteristics. In preliminary analyses of subsamples of the Herschel DEBRIS and DUNES surveys, Wyatt et al. (2012) and Marshall et al. (2014) identified a tentative correlation between debris and the presence of low-mass planets. Here we use the cleanest possible sample out of these Herschel surveys to assess the presence of such a correlation, discarding stars without known ages, with ages < 1 Gyr and with binary companions <100 AU to rule out possible correlations due to effects other than planet presence. In our resulting subsample of 204 FGK stars, we do not find evidence that debris disks are more common or more dusty around stars harboring high-mass or low-mass planets compared to a control sample without identified planets. 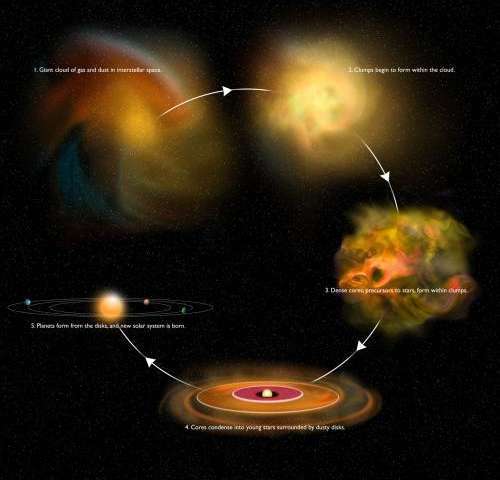 There is no evidence either that the characteristic dust temperature of the debris disks around planet-bearing stars is any different from that in debris disks without identified planets, nor that debris disks are more or less common (or more or less dusty) around stars harboring multiple planets compared to single-planet systems. Diverse dynamical histories may account for the lack of correlations. The data show a correlation between the presence of high-mass planets and stellar metallicity, but no correlation between the presence of low-mass planets or debris and stellar metallicity. Comparing the observed cumulative distribution of fractional luminosity to those expected from a Gaussian distribution in logarithmic scale, we find that a distribution centered on the Solar system’s value fits the data well, while one centered at 10 times this value can be rejected. This is of interest in the context of future terrestrial planet detection and characterization because it indicates that there are good prospects for finding a large number of debris disk systems (i.e. with evidence of harboring planetesimals, the building blocks of planets) with exozodiacal emission low enough to be appropriate targets for an ATLAST-type mission to search for biosignatures.